Jesus Christ. I just moved another air purifier closer to my desk (there are 15 in my office already). I have one in my house that’s running 24/7 now too. The last step will be to wear the Respro whenever I’m outside. 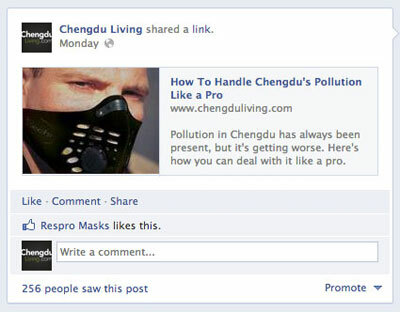 Who’s going to be first to walk around with an oxygen tank looking like an astronaut in Chengdu? That would make a proper statement. Actually as a side note, it’s interesting that the ‘official’ figure was at 303. That’s way and above any previous figure I’ve seen from the government readings. Looks legit according to the US Consulate. Government figures aren’t reliable, but wow, that is high even for them. We wouldn’t have any polution if it wasn’t for all these air filters we’re running! Muckrakers. All I see is evidence of harmonious air particulate. Where heaven and earth unite in a peaceful relationship. Leaded water, an absence of wildlife and thick, syrupy air are all healthy signs of a flourishing economy, China’s Minister of Environmental Protection told an open-air audience at the Renmin University Center for Conservation and Sustainability on Monday. “Heavy fog is a sign of strength,” Wang announced from inside a Bosch hermetic eco-chamber, considered standard issue for top-level urban cadres. “To paraphrase our late Supreme Leader: to pollute is indeed glorious. “It doesn’t matter if the air if black or white – as long as you can breathe it,” he added to laughter. The pollution today was disgusting I could not breathe as I walked to work I felt the need to regurgitate with every step I took outside. 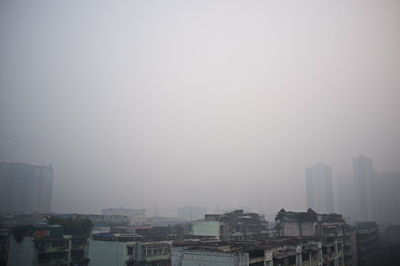 My colleagues were saying that Chengdu is clean much cleaner than other cities in China you foreigners complain too much about natural fresh air then they proceeded to open the windows. When I went home and cleaned my ears out the filth that came out was beyond words and I do have the urge to take the cue tips to work and make them feel grossed out and say there is your flipping fresh air!! Just leave the Q tips in your ears Diamond and it will block the problem. Either that or breath through your nose like normal people. Where are the protests? Oh, right, the Diaoyu islands are much more important to everyone’s daily lives. Crazy. I think you could find a photo from the last few months that resembles the one on the left. 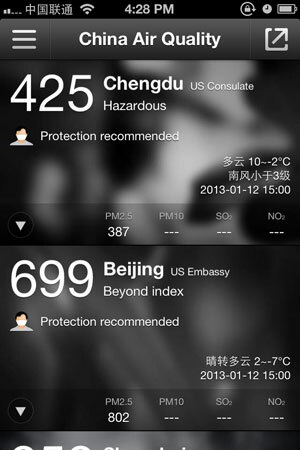 I think Beijing has pretty recently had pollution as low as 50. 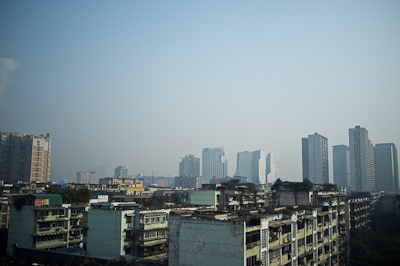 I think wind from the north clears out all of the pollution periodically. Protests over air pollution produce no sense of national identity or superiority! I’m looking at a 399. Seriously, what’s been going on the last week or so? It’s been edging at 400 every single day and night. I have no idea what’s going on. It was 340 or so when I woke up, now it’s 400. What a beautiful day today. The first one since I started taking daily photos of the sky! Wow, what a difference. What was yesterday morning like? 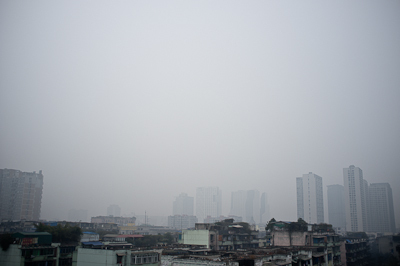 when I got back to Chengdu in the afternoon it was surprisingly clear, with an API of 99 late afternoon/evening.